While looking into the issue of Nintendo potentially making the DSi's anti-piracy tech more robust, I also checked to see if it was possible that legitimate copies of DS games weren't working in the DSi. Based on the people calling in to Nintendo to talk about DS games they own not working in their DSi, Nintendo figures it most likely due to dirty game cards and not bad coding. As is common after the launch of any new hardware system, we have fielded inquiries from consumers about their games. To date, an extremely small number (about 0.025 percent) of Nintendo DSi owners have inquired about playing their licensed DS games, though the most common issue has been related to dirty game cards. Nintendo recommends that players keep their game cards in the original packaging, or in protective cases to keep them free of dust and debris. Yes, they mean .025 percent, not 2.5 percent, as in 1/40 of one percent. If I were to do the math on that, based on Nintendo's announced first three days of DSi sales in North America, we would be talking about 75 people. Of course sales have to be higher than that by now, but it still a pretty small number it seems. 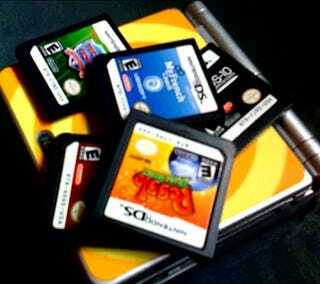 Where do you store your DS carts? Me? When they're not in LittleFoot's mouth or the washing machine, they're safely sitting on my desk.